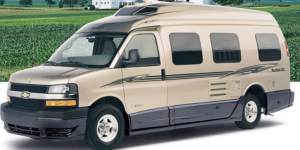 If you are looking for a means of travel that offers the kind of amenities found in the bigger motorhomes, yet provides the ability to navigate in more places and travel on more roads, you will want to see the Forest River 2013 Lexington 265GDSF motorhome. While some RV dealers call it a Class C, Forest River names it their Class B+. The Lexington has four floorplans, ranging in an exterior length from 28 ft. to 32 ft. 3 inches. 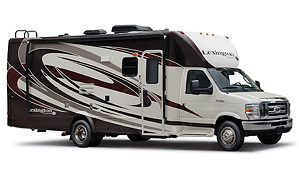 We want to tell you about the 28 ft. Lexington 265GDSF. This Class B+ is built on a Ford Chassis, has a 55 gallon gas fuel tank, a gross weight rating of 14,500 lbs. and a cargo carrying capacity of 3,300 lbs. Manufactured with tough fiberglass construction, the Lexington 265GDSF has a classy, eye turning look due to its full body paint exterior and design. Easily maneuverable on the road, including a rear backup camera, the features of the Lexington make for a smooth, comfortable ride. The exterior height is 10 ft. 7 in., has a 16 ft. awning and is built with two slideouts, including a slide-out pantry that delivers an abundance of storage room. The fresh water tank holds 44 gallons and the gray water capacity is 35 gallons. The Lexington has a 40G Guardian generator, 13.5 BTU ducted roof A/C and a cab featuring a 7” Touch-screen AM/FM radio w/ CD, DVD, USB, Aux, Weatherband and Bluetooth. Amenities that will make you feel you have a home away from home include a 32 inch flat panel 12 volt TV, a kitchen with microwave/convection oven, range and sink with covers, and a private bath with sink and a split shower/bath. There is plenty of room in the Lexington and this Class B+ can sleep 3 comfortably and seats up to 6 people, with plenty of room and comfort for relaxing, games, TV, eating or taking a nap. We found a sale list price of $93,517. Forest River is a RV manufacturing company that has been building RVs since 1996. 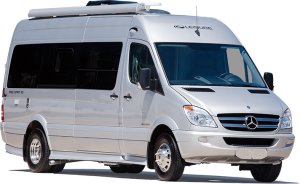 Reviews and ratings are mixed for this company so you will want to see the details in our Motorhome Comparison Guide to know if the product you are considering is one that rates highly. Purchase our book before making such a major investment and you will not be disappointed in your choice of a motorhome or a manufacturer.